So first of all as we can see the monitor comes in this nicely printed box, will present well in retail stores. The packaging inside is fairly basic with styrofoam packaging, so if ordering online make sure to check for any damage once the parcel arrives. Out of the box some assembly is required. The stand is non adjustable, fixed at one height and does not tilt. It's all finished in piano black. Now there is something that needs mentioning. LG has been providing some images for retailers to use for advertisement. You see the stand has a transparent section. Which makes the monitor look more attractive. Leaves a fine print that actual product may vary. Shame Shame. 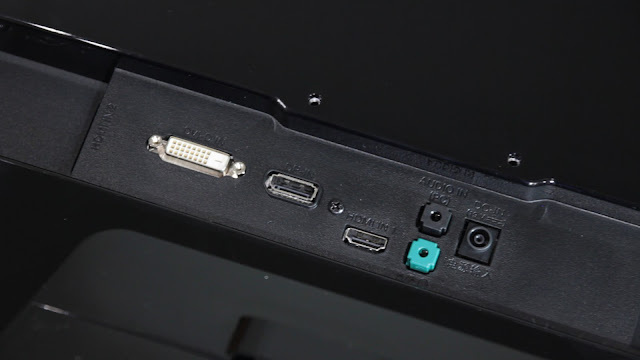 At the bottom of the monitor there is a 4 direction button. This is the best invention since sliced bread. Its like a marriage between Ergonomy and Tactile feedback and Functionality and Ease of use. Ok its more like a party, however you look at it, its a simple idea, that should be used with every monitor, or anywhere it is applicable. 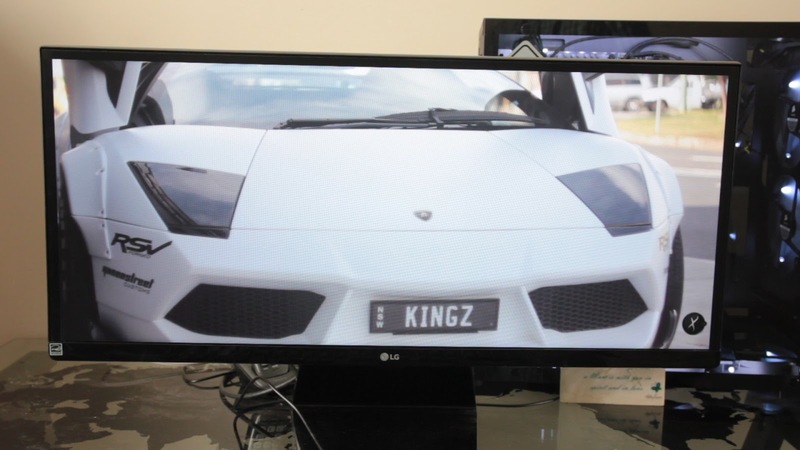 The height of the monitor is 41 cm from the bottom of the stand to the top of the monitor and is 70 cm wide. The diagonal measurement of viewable screen 29” or 73cm. So the first and the most obvious thing to talk about is the ultra wide aspect ratio of the monitor staring right back at us. The aspect ratio is 64:27, and this format is used in movies very often which I shall explain in a second why. 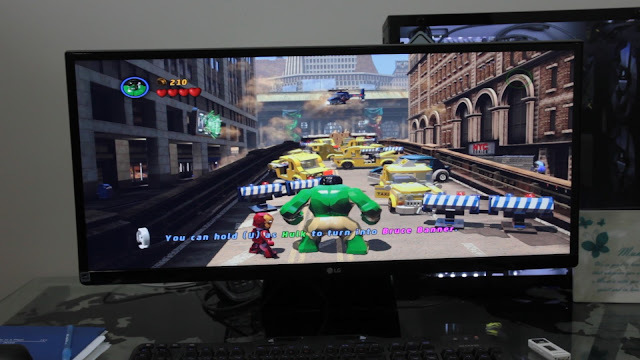 The last time I mentioned this odd figure in the Dell ultra wide monitor review some one told me it should be 21:9. However if we work out 21/9 which is simply 7/3 equals 2.333333 which is a wider ratio and is not accurate. 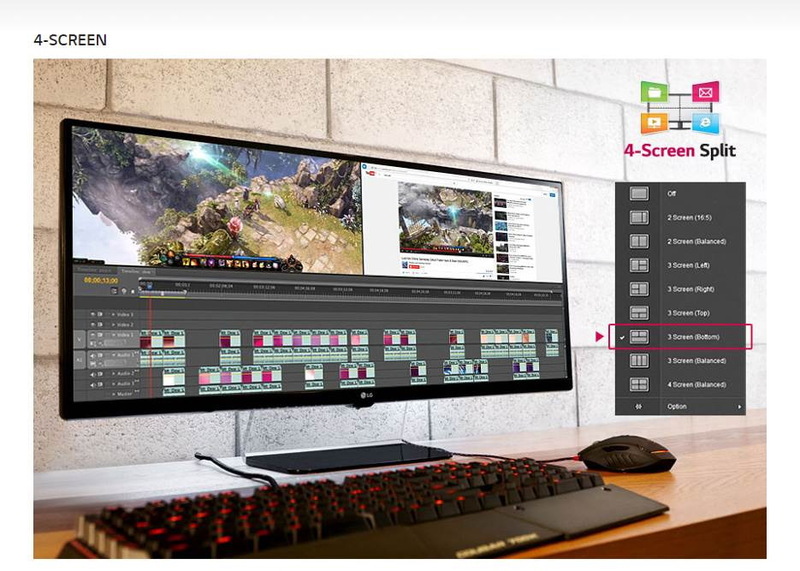 But who cares about math, 21:9 sounds fantastic for marketing. Marketing.. Yukh…. But it is an important consideration, a lot of content exists in this ratio. Movies specially uses this aspect. So in a 16:9 screen (which is by the way two 4:3 screens side by side) we often see the letterbox black bars at the top and bottom of the screen. 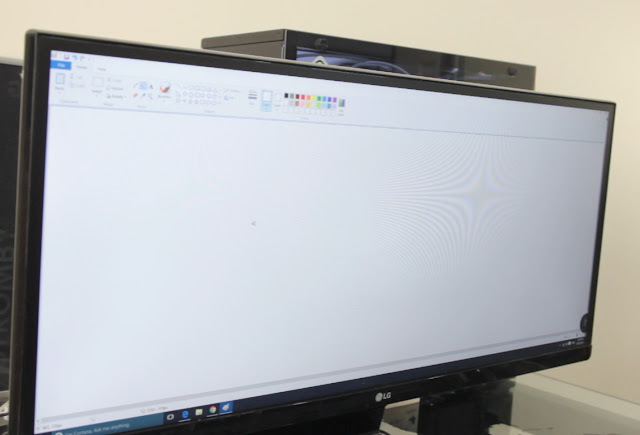 This disappears in the ultra wide monitor. For gaming it makes a difference too. And very specifically what kind of games you are playing. For example a side scrolling game like Ori and the Blind forest, if we change the resolution the image simply stretches. And it needs to since its a side scrolling game, the extra bit of image which otherwise was hidden will become visible giving the gamer an unfair advantage. Or in some cases it might just ruin the puzzle by giving away what was meant to be not seen till you reach that point. In other kinds of games the benefit is very much upfront and direct. More content on screen. For a game like this very literally more real estate. And yes there are more and more games that are supporting this aspect ratio and therefore giving the gamers that extra visibility. And while we are in the subject of visibility, I’ll just quickly mention that the monitor is addictively useful for general office type work, if you need dual desktop but can't have it, you can make do with this very well. It does do split screen and dual input so there is some flexibility. With regards to the picture quality. Lets first start with black. If a monitor does black properly we know its on a good start. As we can see the edges of the monitor has black bezel, when the screen turns dark you can barely tell the bezel apart from the view able area. So images with good contrast is not a big issue at all. Moving on to colour reproduction, LG claims that the display has colour gamut of 99% sRGB. On top that the panel type is IPS. So whats the difference. All we have to do is place it side by side to a non IPS regular garden variety office LCD monitor. And just watch with our naked eyes. The difference is very immediately apparent. Viewing angle is one thing that I have some complain about. If we are looking at the monitor straight and at the center. Its an even image. If lets say you are showing your work to another person who is standing next to you will see an inferior image. In fact if I sat a little too much to one side, I could see the contrast changing. Viewing angle vertically is not that great either. Response time is another thing. 5ms grey to grey. That is hard to measure since the refresh rate of the monitor is 60Hz which is 16.667ms, and they do not mention which grey to which grey. You see in a 8 bit chart there are 254 shades of grey not 50. Marketing strikes again. This is a simple tool to test the response time, credits to the author of the page. We can note the milliseconds by calculating the reciprocal of the shutter speed then multiplying a by thousand. At 2.5 ms we can see dark to light bar forming. At 3.125ms we have light to dark bar still fading. At 4 ms it nails it. Which is very interesting. Because at 5ms we have a bit of ghosting. As is with 6.25ms which should not be the case, while 2ms catches another perfect frame. I have repeated this test several times with same numbers and results has been equal. But for our purpose of gaming, its safe to say a human eye can not detect this ghosting. All this action took place at a very high speed. There is an anti-glare screen surface coating. While this is a standard in monitors these days. I don’t like it. The way it diffuses light reflection effects image visibility. Rather a clear glass would have been better. And last thing is that its speakers are ok for a built in monitor speaker. If you do not need a dedicated speaker for heavy bass or symphonic precision. This will work fine and is loud enough for presentations and lectures, etc. So in conclusion. 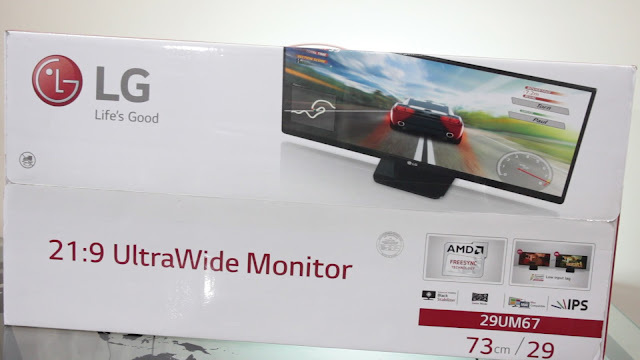 The monitor did almost everything that it promised. Viewing angle is something I am not happy about. But going past that there is not much else in the way of criticism. The ultra wide format is up to one’s personal consideration and at the moment the monitor retails at about $450 au. There are other good choices at this price point if 16:9 aspect ratio will do. 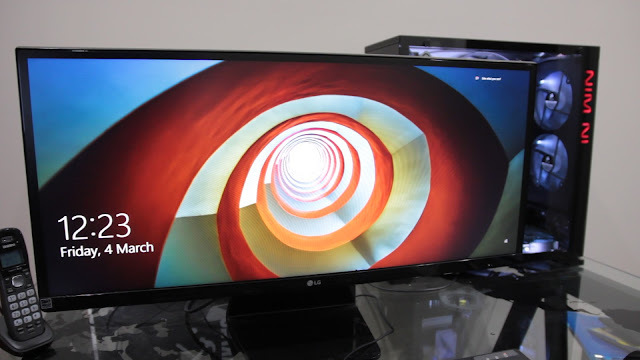 Eitherways, anyone who owns this monitor will have little to complain about as far as the day to day use is concerned. Anyone including content creators, stockbrokers, web surfers, mums and dads and gamers alike. The picture quality is brilliant with dark blacks and vivid colours, with extra bit of desktop realestate. Enjoy. Original Video review published on March 18th 2016.